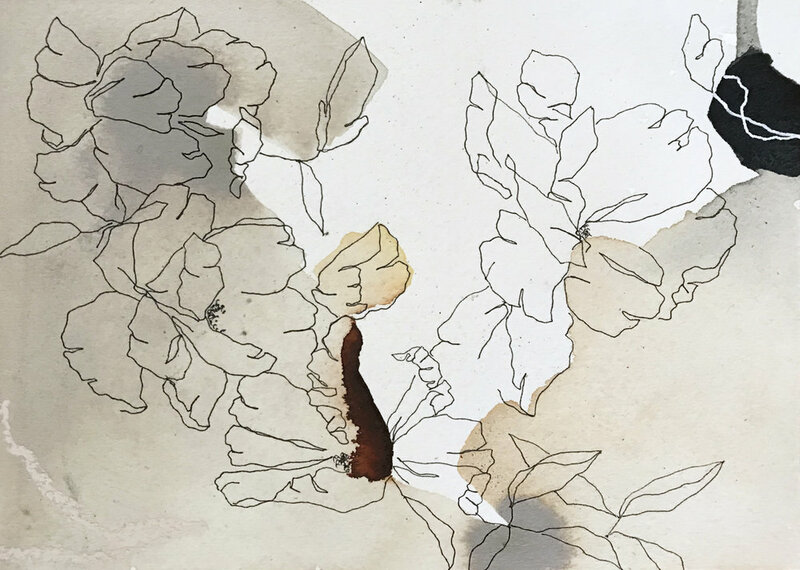 We embarked on a journey to explore the colors, textures and movement of flowers through pen on paper, with Atlanta-based artist, Meredith Mejerle (@meredithmejerle). Here we discuss this artistic collaboration and the ethereal mixed-medium artwork, intricate line illustrations and stunning bouquet she created for SPRIG. Your work often explores a floral theme. What sparked your initial interest in this subject? The first painting I ever created was when I was about 3, and it consisted of pink flowers in a field with rain falling on them. I think that moment probably instilled a forever love for flowers now that I look back. Flowers had always been included with memorable moments in life. From 10+ years of ballet recitals to picking Blue Bonnets and Indian Paint Brushes at my grandmother’s, these are some of the moments I can recall most vividly. After college, I worked for a floral design company called Amy Osaba Design, where I continued working with flowers every day. How would you describe your work? What do you hope to communicate or evoke? Throughout all areas of my work, I enjoy evoking a sense of wonder, as well as quietness. There is nothing better to me than getting nose to nose (or as close as you can) with a piece of art, hence my continuous use of thin, organic lines. In such an over stimulating world, I hope my art makes people slow down and observe details we generally tend to miss. I want people to be able to take that notion and apply it to other areas in their life. What’s your creative process – how do you get started? Beginning a new piece is my favorite part. Color palette aside, I try not to have an agenda as to how the piece will end up. I gather inspiration from images of flowers I have saved, flowers in real life, and the flowers I have worked with so many times that I can almost draw from memory. It helps that I still have so many talented friends in the floral industry who are consistent sources of inspiration. The artwork you created for SPRIG is in mixed-medium. Tell us about this approach. I have worked in many areas of the art world (dark room photography, letterpress, screen print, to name a few) and an overarching theme tends to be a tactile experience while creating art. I was always making a mess as a child, to my parents dismay. Pretty sure there is still paint from 20 years ago on the floor of the kitchen to this day. A mixed media process allows me to explore colors, textures, new products and truthfully, make a bit of a mess. Something I strive for is to not get too comfortable with my process, so it’s always motivating rather than mundane. Tell us a bit more about this project and what it was like working on it. Working with a floral brand is a favorite because they know and appreciate your subject matter in a unique manner. They know the heart it takes to grow them, and in SPRIG’s case, to craft them, and they have the eye it takes to create a composition with flowers. That alone makes my job a little easier because they trust my lines and each quirky quality a flower I draw may have. Something I genuinely appreciated about SPRIG is their approach to maintaining those unique and sometimes imperfect lines in their flowers because not every fresh flower is created equal. What was your inspiration for the artwork for SPRIG? I wanted to show that faux flowers can move and dance in similar ways as a fresh flower. Movement is very important to my work as it is in floral design, so it was vital to translate the lines of SPRIG’s flowers as full of movement. After years of working in the wedding industry, I know flowers are an investment - a large investment at that. SPRIG is such a great alternative for those wanting to invest in flowers that move the same way as fresh and invest in flowers long lasting…just like my drawings! I think preservation is another element of my work I would like to continue exploring. We LOVE the SPRIG x MMR bouquet design. Tell us a little about it and how you styled it. My sweet little bouquet of clematis, anemones and eucalyptus. It may sound a little understated, but there is a beauty in creating a bouquet with a limited range to really let the flowers breathe. When you have unique flowers such as clematis and anemones, less can be more. It’s all about those quiet moments and letting your eyes wonder the lines of the flowers. What is your favorite flower? Poppies would have to be a favorite!! I first fell in love with them from the scene from the Wizard of Oz, and again when I was the “snow” in a ballet recital falling on the “poppies”. The way their vibrant, scrunchy petals are curled up in that little pod just baffles me.